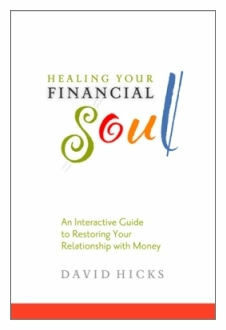 Healing Your Financial Soul was sent to me by one of our readers, David Hicks. David is a communications consultant, and an ordained minister. He wrote Healing Your Financial Soul to address the deep, underlying issues that force us to struggle with our money every day. To me, this book is an excellent example of Teddy Roosevelt’s famous quote “Speak softy and carry a big stick“. This “big stick” in this book is the wealth of facts, and David’s excellent understanding of financial psychology. The “speak softly” part comes into play with the generous humor sprinkled throughout the book, and the realization that everyone has money problems, even the very wealthy. Hicks gets right to the heart of the matter very quickly. In fact, I can honestly say that I learned a lot about myself in the very first chapter. Healing your financial soul is filled with exercises, and visualization tips, all of which have a proven track record in the field of psychology. It was during the first of these exercises that I learned something new about myself. What characteristic describes my heart’s desire specific to finances? What quality of word names it? I am rich in greed. Well, let me tell you I almost fell out of my chair laughing, because it’s so very, very true! I will say that the author clearly intended me to come up with something positive here, something good that could be reinforced. But, my mind sure had other ideas! See, that’s the kind of book this is – the sort that gets you thinking, deep down, about what’s really going on with your money. Now, I’m not suggesting y’all are greedy (I’m from Kentucky, I’m allowed to say y’all with impunity!) Just that greed is apparently one of the challenges I am facing. The beauty of this book, is that it helps you come up with your own answers – the ones that fit you specifically. that you’re supposed to struggle. I love these examples because I believe they are true as well. Many of us watch our grandparents, parents, or friends struggle financially. Somehow, somewhere, we picked up the message that we should struggle too. That you have to struggle for money – you have to fight claw, scrape, scrimp and save just to make ends meet. But what if that’s really not true? What if the reason we struggle is because we believe we have to? Hicks believes that the money isn’t the problem, our capacity is. He sums up the money / capacity issue by explaining that it’s like taking a cup out into the ocean to collect water. Now matter how deep you swim, or how many times the waves break over your cup, you can only carry one cup of water out of the ocean. There are oceans of wealth out there too – money is plentiful. Our capacity to gather it is what we have voluntarily restricted. I love this book, I truly do. I think it says in 264 pages what multitudes of financial books have skipped, or never even touched on. The power to be wealthy, satisfied and happy is ours. The power to tear down success, fail, and fall into an endless pit of despair is ours too. The difference between the two is determined by our beliefs. You should know that the examples I am giving, they are just tiny bits from the first two chapters. Healing your financial soul is filled with positive, thought provoking passages all the way to the end. If I could stress any one thing about Healing your financial soul, it’s that it is a fun book. It’s a happy book to sit down and read. It gives you pause for thought more often that it gives you direct instructions, and with each realization you gain that much more control of your own money – your own life. This is not just a book I will keep and re-read. This is a book I will share with others, and give as a gift at birthdays and holidays, over the next several years. If you’re interested in finding out more about this book, you can check out the website here. David has also agreed to be around to answer any questions, so you can chat with him directly by leaving a comment below. Connie, thanks for your insightful, and generous, review. (And for getting my jokes.) I’ll look forward to people’s questions or thoughts.